Project RISE was started in September 2013 as part of the School State Project, TPSP. It is the result to the essential question, "How can we teach the main consumer about technology in a way that is simple, useful, yet appealing." In order to make an app, you have to know how it reacts with humans. Before making this, we researched and surveyed many people and found similar patterns. We found people prefer simple sentences instead of paragraphs (also explains why Twitter is growing). People will engage in a well designed website instead of something coded in HTML in less than an hour. Images and videos are also beneficial, since we are naturally visual learners since day one. Unlike writing and reading which we develop. Interestingly, it was found that quality is what makes a good first impression. Understanding human psychology is very useful as it gives you the secrets of how our minds work. Especially when designing an app. We used resources to find out that the very little details in anything in the world can affect how we perceive it. Colors, typography, the size, and more incorporated in my product was carved by human psychology. An example would be the specific shade of blue which RISE uses. This shade is very calming to us and engages in activity, very important in learning and also explains why some of us suffer from 'Facebook Addiction'. Teaching new ways to teach. Teachers, cover your ears. We have changed a lot over the past thousand years. A historical era will last no longer than a century since a revolution is constantly happening. Our beliefs change, our lives change, our society changes, so why are we still using nearly identical teaching techniques from 100 years ago? It's time someone does research on teaching the 21st Century. Unlike conventional books and similar products, RISE will only teach what is beneficial to a particular person thanks to the quick quiz given at launch. A person dreaming of knowing what smartphone to buy next does not need to know how to set up a complicated algorithm in Java. Tech. Not just for geeks. Carl Sagan once stated "we've arranged a civilization in which most crucial elements profoundly depend on science and technology." Carl Sagan also admitted that, "We live in a society exquisitely dependent on science and technology, in which hardly anyone knows anything about science and technology." RISE will complete the goal in which we will know technology, everyone will know technology. Technology is what drives the future and innovates mankind. Unarguably the most overlooked topic is beauty. It's difficult to design a product that will be gorgeous to every eye, but designing one that will be loved by the majority is easier. 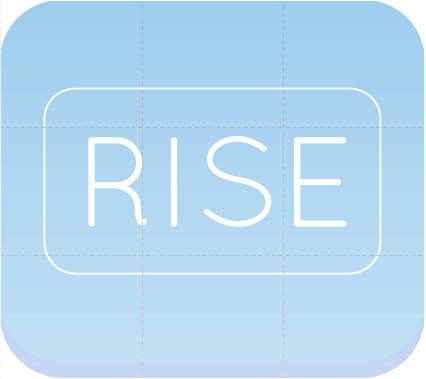 RISE initially started with the desire to make an experience that is just as loved as the app itself. Simplicity is what we found to be an enjoyable experience as when it is designed to work beautifully, it looks like it to. The huge plus, however, was the fact it can be learned instantly, just like the content on RISE.